Last year the peach tree suffered from not treating it with an organic fertilizer spray before it bloomed. Later in the season, when I was desperately trying to save any fruit I could from my single-tree crop, I consulted with the local nursery where I’d bought the tree and they told me to start early next year, well before the flowers bloom. “Early” this year is even earlier than anticipated. A lot of things have started growing early, good so long as we don’t get a long cold spell. Was it your peach tree that had a problem with some bugs last year? Oddly enough I went to the home made soap site http://www.simplycleansing.com/ to find out how to spell Patchouli (keep forgetting how to spell that) and the site has grown. It has more info on what the soaps are good for, comments from users, and a section on some creative ways people have used the soaps. There were actually 2 uses for the garden. One, dissolving the soap in water to use as a natural bug spray, and a person who hung bars in a tree to repel bugs. Check the site for details, it’s been expanded since my last visit. On the soaps, off the topic, I’ve been using them for about 6 weeks now. The first 4 weeks I used the Patchouli soap. I began using it in place of commercial shampoo, and shortly after for shaving. Two people who had no idea about the soap asked if I got a hair cut- I didn’t. I got to thinking about that and realized the soap was working as a conditioner so my hair was softer and not as dry. Two people at two different times noticed a difference- I doubt that was a coincidence. After 4 weeks I put the remaining Patchouli soap aside and began using the tea tree soap. Like the Patchouli, the scent is subtle. I like the Patchouli smell better, but that is just my preference. I can say that after 6 weeks my hands are nice and soft. About the only other thing I can add is that I gave a bar of spearmint soap to someone with dry and itchy skin who has gotten prescription creams for the problem. She recently told me the soap has helped the itching. So, in summary I recommend the soaps. They are more expensive than commercial soaps, but they can replace shampoo and conditioner so they will probably save you money. Visit the site, http://www.simplycleansing.com/ and take a look. In addition, you are helping to support a small family business. I’m going to check them out. My shampoo is just about out, and I think I’ll give them a whirl. Also, overuse of pesticides and other chemicals has been on my mind a lot lately, as we recently received news of a very young family member (only in the 20s) was diagnosed with cancer and is now undergoing aggressive treatments. It’s best all around for us to try to limit if not completely eliminate the sources of chemicals that we put into our bodies (it’s not just the food but, as you have pointed out, all the many products from lotions to soaps to shampoos that are mucking us up). Next time I go to the site I’ll see if I can find it and post a link. Thank you! I will definitely check this out. I almost wonder if I’ve run across it myself because I kind of remember hearing that before. Definitely will check it out! There’s probably more, that’s all I saw for a quick look. I hope everything works out for your relative, I also have a cousin that’s been fighting cancer for a while now. Recently I’ve been listening to a series of old podcasts (The Health Ranger) at http://www.naturalnews.com/Index-Podcasts.html which are quite interesting. If you have the time check it out and pick a topic or two that sound interesting. You will never hear any of this on the news or from your doctor. I wouldn’t believe everything without doing some research, but the majority of information sounds reasonable. It seems my new bamboo shoot was not bamboo. After tracking it’s growth at maybe an inch per day, nothing compared to the last shoot, a couple leaves finally opened. I recognized them as the same as the trees in the yard. I pulled it out and found the nut/ seed under the soil confirming my suspicion. It must have fell in the pot while it was outside. On the bright side, the warming weather and selectively putting flower pots out in the sun is paying off. The first red ti I planted now has a stem with what looks like a reddish unfurling leaf. The second branch I planted has a number of buds that are finally getting larger. The remaining branches in soil have not grown anything new above the soil yet, but the roots are growing. I guess it shouldn’t be a big surprise that plants coming from Hawaii like heat and sun. There’s still a few branches in water with nice root systems that I need to plant. There will be too many of these things, so if all works out I will bring a few to the next seed swap. The day was so nice I went out back, raked up the leaves I left from last year and made a long pile. I fired up the lawn mower and used it to mulch the leaves. I also started my garden journal. It’s a soft copy I made with a spread sheet and I figure I’ll leave it on the PC for a while until I see what evolves. Nothing fancy so far, one column for the date and the rest of the line for notes. I didn’t do it today, but I am thinking of keeping track of the soil temperature. I will probably make a separate page for that and divide the yard into sections even though most of it is still ‘wild’. That information may help decide what and where to plant. I’m glad to hear that you have a simple solution to the gardening journal question. Not overloading it at first will give it room to evolve, as you get new ideas about the information you want to store. I have been considering using the front yard just for flowers. My philosophy since last year has shifted. Whereas last year, I wanted nearly everything to have a very pragmatic, practical use, as I’ve been walking around the neighborhood lately, I’ve come to appreciate the effort my neighbors have put into beautifying their areas. It’s like a gift to whoever walks by to have a little burst of color or beauty out for them to see. Besides, I do worry about plants in the front (that I might ultimately consume) absorbing too much pollution from the cars that pass by. I haven’t started my garden journal yet but I have in mind something along the lines of what you’re doing. If I learned anything from last year, it’s KISR: Keep It Simple Revel. I am going to plant some flowers in the ‘wild’ space of my garden. I just saw some bees out back, probably feasting on all the tree blossoms- go bees! Thanks for this. I do have to admit, I had a huge bit of joy when I realized my begonia petals were edible. They were delicious and pretty on a bunch of cupcakes I made for the BK Food Swappers event late last year. I tried taking a few measurements of soil temperature, but while the sun is out there’s a lot of variation. One day with no sun I did find something of a hot spot. One small area was about 7 degrees warmer than the rest of the yard. My best guess is that the leaves were composting and giving off heat. I can’t think of any other explanation unless there’s some radioactive material in that spot. That’s very unlikely, but on a very long shot I will check it. Yes, I have had a Geiger counter for quite a few years, but only because of something of an interest in radiation since high school days. Doesn’t everyone have a counter?? Anyway, in the shade my soil seems to be about 57 degrees or so. Still a bit cool for a lot of plants. I resisted doing some early planting, and now am glad I did. Already I’ve heard comments on FB from friends who went ahead and started planting and are having problems already because of it. I watched the peach tree and what was happening with the blossoms. Thy appeared early but I didn’t trust it. I was right not to. While I got a pretty little show of flowers, it wasn’t as complete as it normally is. The cold spell that came through stopped the blossoms. Now it’s just wait and see how it affects the fruit, if at all. 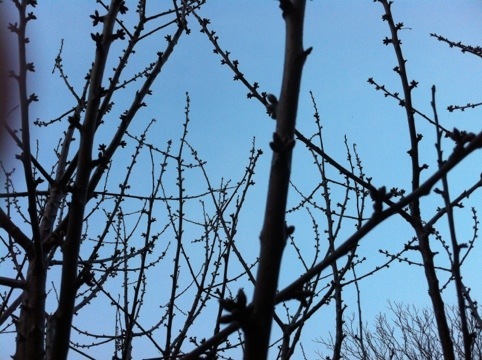 According to one site (http://ncsufruittree.blogspot.com/2008/04/recognizing-cold-damage-to-peach.html), a number of variables will determine whether – if at all – cold will affect the crop. According to this writer, you can lose up to 90% of your blooms and still have a good crop of peaches. I didn’t lose so many blooms as it was apparent the cold inhibited their usual full production. Fortunately, in the roughly five years I’ve had the tree, I’ve never had to worry about this before. With these unpredictable weather patterns, though, I’m preparing myself to be dealing with it in the years ahead. I still like to take a look in The Old Farmers Almanac every now and again, especially the weather section. Once again I used it to pick out a couple vacation weeks too. While not always right, they are pretty good at predicting weather. That reminds me. It was on my mental list to pick it up and check it against our wacky weather of late. Some stores carry it by the registers, or a bookstore would be a good bet. There’s more than one almanac. The ‘good one’ has a yellow cover with The Old Farmers Almanac on the cover. I subscribe to it but it costs nearly double the price that way with a pocket sized calendar/ planning book. Yep, the one I have is the kind that was around in friends’ bathrooms when I was growing up. Seems everyone had one on the back of their toilet. It seemed somehow daunting to me then. In fact, I just opened it (had it stashed in my closet since I bought it before the new year), and flipping through it, it’s still a little daunting. I’ll take it with me on the subway though tomorrow morning and check it out. I just spotted a gardening article that looks perfect for the ride in. The version I have I think I bought at a gas station when I went out of town last year (though I don’t remember where now). It was only $5.99. Who’s Watching out for the Environment? Not Congress.